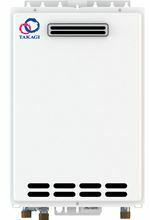 The Takagi T-K4-OS is a mid-sized gas water heater in the Takagi tankless line and is the same as the T-K4-IN, but for outdoor installation only (Moderate temperature climates). The T-K4-OS has gas inputs up to 190,000 BTU per hour - can meet all the hot-water needs of your home, business or condo with one or two bathrooms. The T-K 4 OS has an energy factor of 81% to 83%. At an average (rise in temperature) of 60°F in warmer areas - where the winter ground water is 60°F and with the output set at 120°F - the unit will provide 5.2 GPM. The All new T-K4-OS has a max GPM of 8.0 gmp. For indoor installation - use the Takagi T-K4-IN. The four preset temperatures on the unit are: 113°F, 122°F, 131°F, 140°F. To achieve any temperatures other than those presets, your client will require the TK-RE02 temperature controller. 2 to 2.5 Inch W.C.
3.7 to 4.0 Inch W.C.